Have you ever been abroad for a long time? Did you notice how after a period you start yearning for the home-made food you grew up with? How the smell of anything remotely familiar gives way to a wave of nostalgia? When I was 18, I lived abroad for some time. At that time other than my favorite Chocolate Cake and a few other sweets, I didn't know how to cook anything! And although at one point in my life I thought I could live on Chocolate Cake alone, it didn't work!!!! One day, I felt I couldn't function without having a homemade, Arabic meal. I missed Middle Eastern and Arabic food with it's spices and special flavor. I missed the aroma that fills the house when you cook Arabic food. I was in despair, and no restaurant meal was satisfying enough!!! So I decided to cook Chicken with Vegetable Rice. This was before the advance of mobile phones and the Internet, when international calls were way off the roof - eliminating any chance for calling my mother for detailed guidance. How difficult could it be I thought? 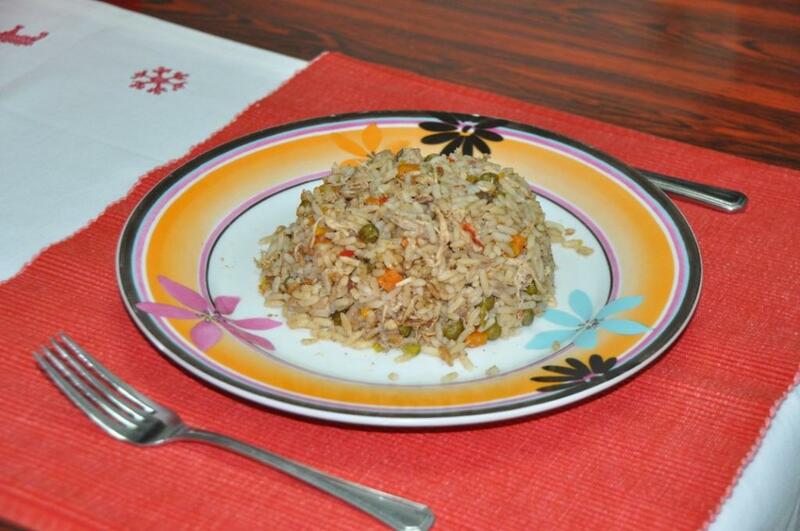 You throw in the chicken, rice and vegetables and voila, your meal is ready! And that is exactly what I did. The outcome you ask? LOL... an inedible dish that even the alley cats didn't come close to!!! In all my ignorance, I didn't add salt let alone the various other spices and seasonings that are used in Middle Eastern food. I didn't precook the chicken ... in short didn't do most of the work. This was my first attempt at cooking a main meal dish. As disastrous as it was, it didn't stop me from trying again and again until I nailed it! I hope you enjoy the finished product as much as I do. 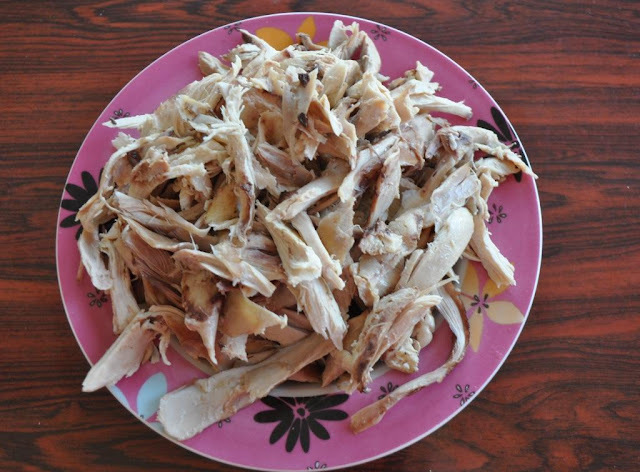 Cut chicken from the middle and wash well. After that, I like to scrub the chicken with 1/2 a lemon, leave it for a few minutes then rinse. Place all the ingredients for preparing the chicken in a pan, add water to cover. Cook, covered, over medium heat until chicken is tender. Remove the chicken from the water and leave on a tray to cool. While still warm (easier to handle), remove all the skin and bones. As for the chicken broth, pass it through a sieve. Keep the 4 cups you need for this dish and store remaining amount in the fridge for later use. I usually cook 3-4 chicken, remove the skin and bones, divide them into separate meals and freeze. This cuts back preparation time for future meals. Heat the oil, add the onions and garlic and saute until it turns light yellow. 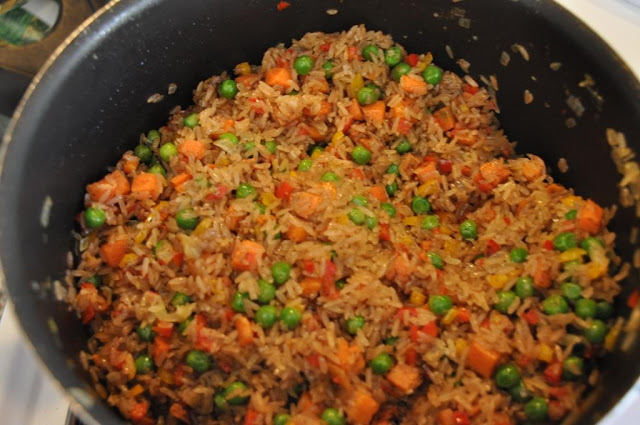 Add the diced peppers, green peas and carrots and turn over medium heat for about 3 minutes. Add the rice and all the spices and turn for another 3 minutes. This is important to infuse the spices into the rice. Mix the chicken in. Add the broth and salt, mix well. Cover and cook over medium to low heat. Serve with yogurt or mixed salad. Hope you enjoyed today's easy recipe: Chicken with Vegetable Rice. Bon appetite! Do you have any kitchen stories to share with us? Help needed for us hillbillies: What is "full mixed spices"? It is a mixture of seven spices. Those living in the Middle East you can buy it ready. For those overseas, I will post tomorrow how you can prepare it at home and store it for later use. Thanks for bringing this up. Seta, we tried this recipe today. Just finished eating and we loved it!!! Cant wait to try more of your recipes. Glad to hear that Tania:) let me know how it goes with the other recipes. I will be downloading more next week once i am back!